All transactions are safe and secure with a reliable history in online purchasing behind each of our associates. 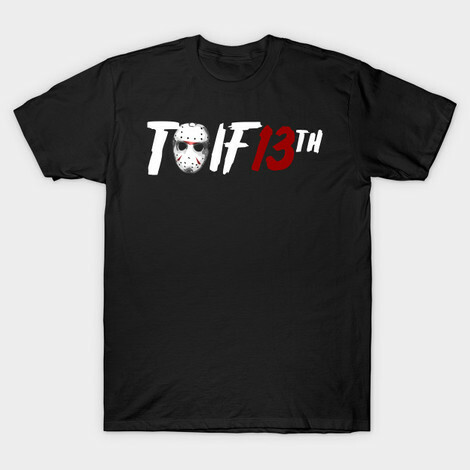 Buy the Thank Jason It's Friday the 13th t-shirt to own Friday the 13th clothing and merchandise. The fronts of these Jason Voorhees t-shirts feature the machete swinging Camp Crystal Lake killer's mask in place of the 'J' in the phrase TJIF 13th. Yes, we can all thank the machete wielding killer Jason Voorhees that it's Friday the 13th, or we can at least have a much more frightening day because of him. Put on your hockey mask and celebrate by scaring your friends. In addition to the Thank Jason It's Friday the 13th tee above, browse the Friday the 13th Clothing Gallery for more apparel like men's and women's clothes, kids shirts or hoodies.